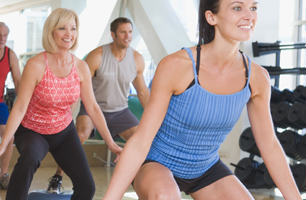 Home › Exercise › When Should You Change Exercises? Beginners make fast progress, even when doing the same workout week after week. Therefore, they should keep the same routine as long as that routine is producing results. Changing things too frequently creates negative interference, slows motor learning, and prevents a gradual increase in weight and intensity. In fact, it is difficult for a beginner who is not used to strength training movements to reach the critical threshold of intensity necessary for rapid growth. If you are a beginner, the best way for you to increase intensity is simply by increasing the number of repetitions. For example if you completed 10 repetitions on the leg press exercise during your last workout you would simply increase the repetitions to 11 or 12 with the same weight resistance and without losing good form/technique. The better you become and the more experienced with strength training, the more your muscles resist growth. You will receive fewer and fewer benefits from the same workout routine. Sometimes, it even gets to the point where you must radically change your routine at every workout for a given muscle. The goal is to try not to repeat the same movements too often, and you can do this by alternating exercises. Make sure that the changes and logical. It is therefore, in many instances, in your best interest to hire a qualified personal trainer or coach to assist you with the design of an effective periodized training program that takes the guess-work out, especially for those new to the strength training world. Duane De Jager, M.Ed, BPE, B.Ed.